Last post, I gave a rundown of developing trends in grappa distilling that are clouding the clear spirit that I have long enjoyed. Despite my loyalty to traditional, unaged grappa, I don’t think all these changes, especially producers’ exploration of the effects of different sorts of wood and different periods of aging, are necessarily bad. Some in fact are quite successful. 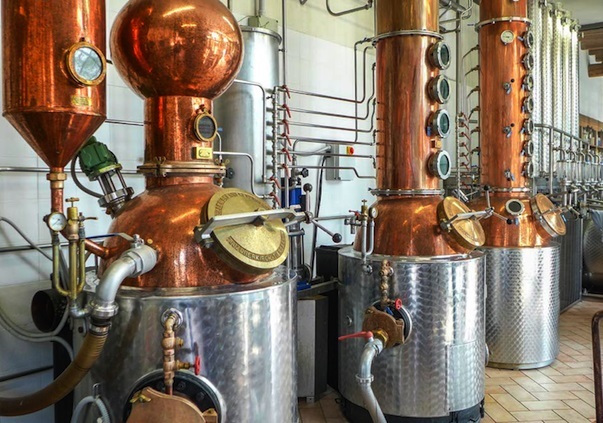 Evidently, much depends on the individual distiller’s goals and the skill he or she (a surprising number of grappa makers are young women, which in itself marks a whole new age in grappa) brings to the task. Here’s a quick rundown of what our group of journalists and mixologists tasted over six distillery visits on the trip sponsored by Hello Grappa last month. 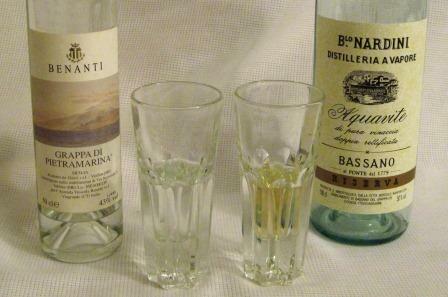 Grappa “Of” is the trademark name, produced in several versions. The makers of Alexander grappa, now more of a sparkling winery than a distillery, though they also make gin, vermouth, etc. Nevertheless, Bottega produces several fine grappas. Tosolini was among the smallest distillers we visited, and for me one of the most interesting. A third-generation Friulian distillery near Udine that produces both grappa and “Most,” essentially a classic wine-based brandy made from local grapes. A very large producer, making perhaps half of Italy’s grappa, and very interested in long aging of its grappas. At the end of dinner we tasted a 14-year-old, a smooth, elegant, cognac-y brandy, very fine, but no longer grappa. 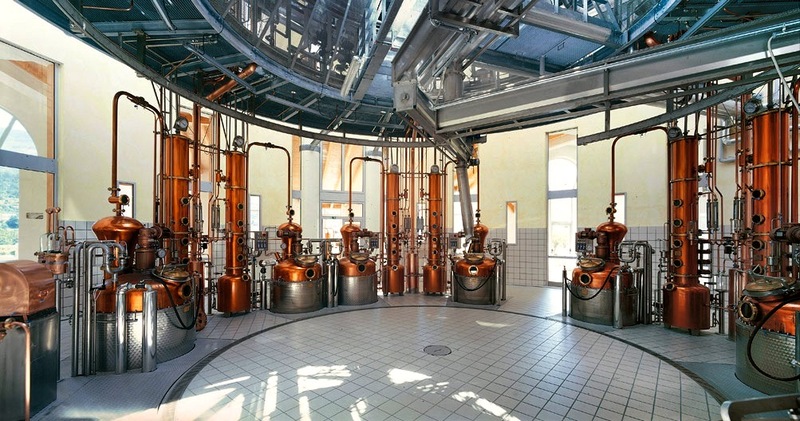 Another third-generation distiller, with a very modern facility in Trentino. There are also (which we didn’t taste) Affina Rovere, from Teroldego and Marzemino, and Affina Acacia, from Muller Thurgau and Moscato. 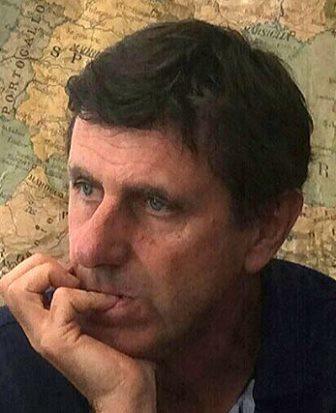 Marzadro struck me as a very thoughtful and painstaking producer. The oldest distillery in Italy, located near Mezzacorona, and making many grappas, both traditional and aged. 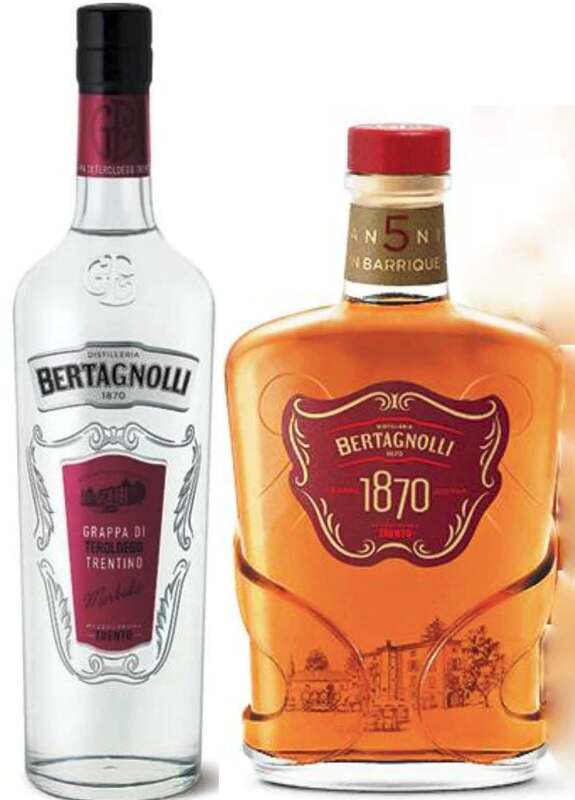 While experimenting with new styles in grappa, Bertagnolli hasn’t lost sight of its roots. 1870 Grappa Riserva: Teroldego and Cabernet sauvignon, 5 years in barrique; slightly brassy color, pungent dried grape and wood aromas; smooth and predominantly grappa, not wood, in character, very nice – one of the most true-to-grappa characters of the aged grappas we tasted. 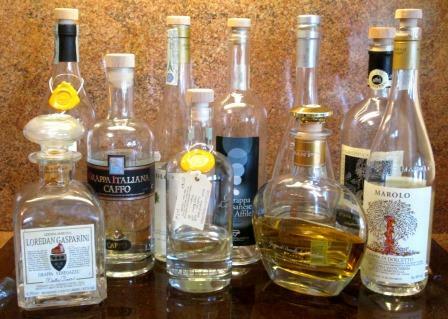 As you can see from all this, grappa has become a very diverse distillate. Given the many different grapes grown in Italy, traditional grappa was already quite a variable drink, and I’m afraid the tremendous variety now available is only going to overwhelm and alienate the new audience it’s meant to attract. I hope I’m wrong: Certainly, some Cognac and Armagnac drinkers should find aged grappas an attractive path into the grappa forest. But will cocktail drinkers be persuaded to wander in those woods? I guess only time will tell. 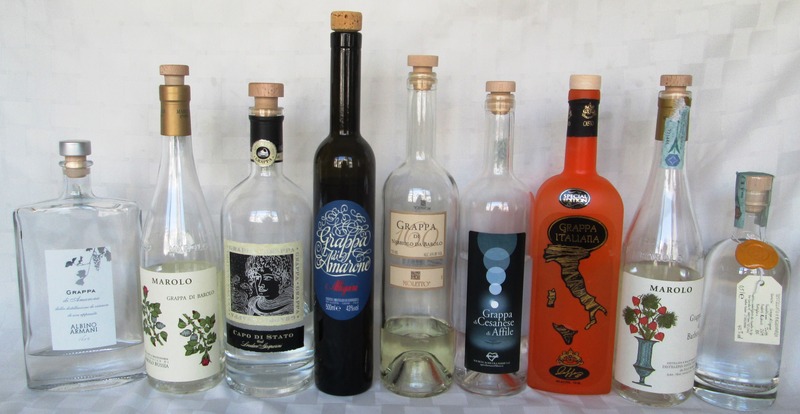 Grappa: Clearly Fine, but Lost in the Woods? 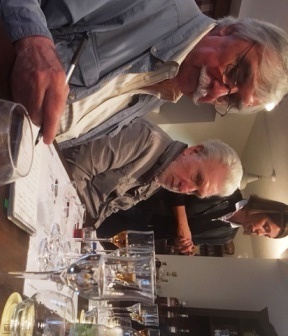 My recent tour of grappa distilleries, sponsored by Hello Grappa, and in the company of a collegial group of writers and mixologists, was just as pleasurable as I had anticipated, and far more informative than I had expected. I’m one of those smart alecs who thought he knew all about grappa; after all, I’ve been drinking it with relish since most of it was thought of as a long-haul trucker’s breakfast drink, and I’ve continued right through its transformation by up-scale Alpine and Dolomite skiers into the fashionable after-dinner drink and after-ski warmer it now is. What could there possibly be for me to learn? Much, as it turns out. Not only is there more to the art of distilling than I had realized – there is in fact far more art to it than the relatively straightforward process of distillation would seem to allow, for one thing – but, like so much else, the world of grappa itself is changing. Traditional grappa is a clear spirit, aromatic of whatever pomace serves as its base, and fiery or elegant as its maker chooses.But those makers have come to realize, as Alessandro Marzadro, the latest generation of his family-owned distillery (almost all grappa distilleries are family-owned) put it, 90% of the spirits that are drunk neat, as grappa traditionally is, are what the trade calls “brown goods,” and 90% of the clear spirits in the world are used in mixed drinks. 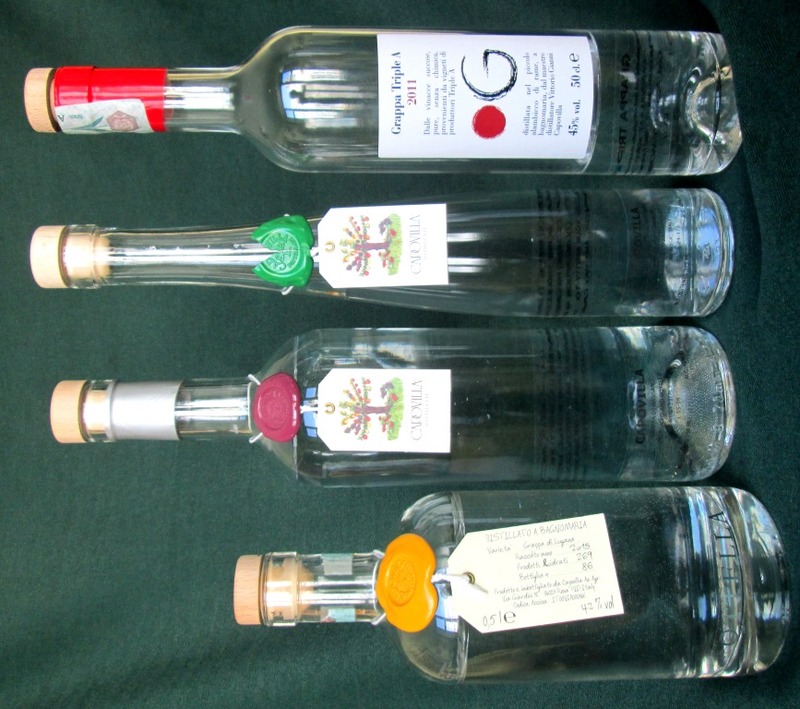 So grappa, it seems, is an anomaly, a clear spirit in a brown-spirit niche; and to increase its market grappa would have to become both a clear spirit and something else – a sipping whisky, so to speak, and a base for cocktails. All the grappa makers our band of merry pranksters visited seemed to be grappling with this dilemma. A few were trying to create a lighter-bodied, less fiery, clear grappa that would appeal in cocktails and mixed drinks. We tasted several of those, some of which were very successful, most of which seemed to me indistinguishable from mixed drinks made with who-knows-what. But I am not a cocktail drinker, and defer to the opinion of those who are: Several of our comitatus were quite excited by many more of these drinks than I. All the producers we visited were investigating aging their grappas, using different sorts of wood and different periods of time. The experimentation is ongoing, and there are many, many options available for distillers to explore. 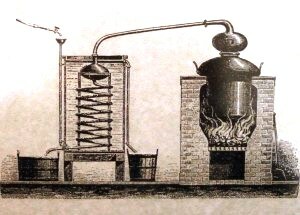 This is undoubtedly making matters very complicated, not to mention costly, for them: Tracking numerous different micro-distillations, and tying up salable grappa in short- or long-term aging experiments present all too many opportunities for both producers and their grappas to literally get lost in the woods. The aging durations most frequently used are 12 and 18 months, and an 18-month-aged grappa may be labeled Riserva. All grappa runs clear from the still: Barrel-aging imparts, among other things, color, which may range from pale yellow to dark brown, depending on the type of wood used and the length of the time in barrel. Oak is the most common wood employed, but ash, chestnut, cherry, and acacia can also come into play. 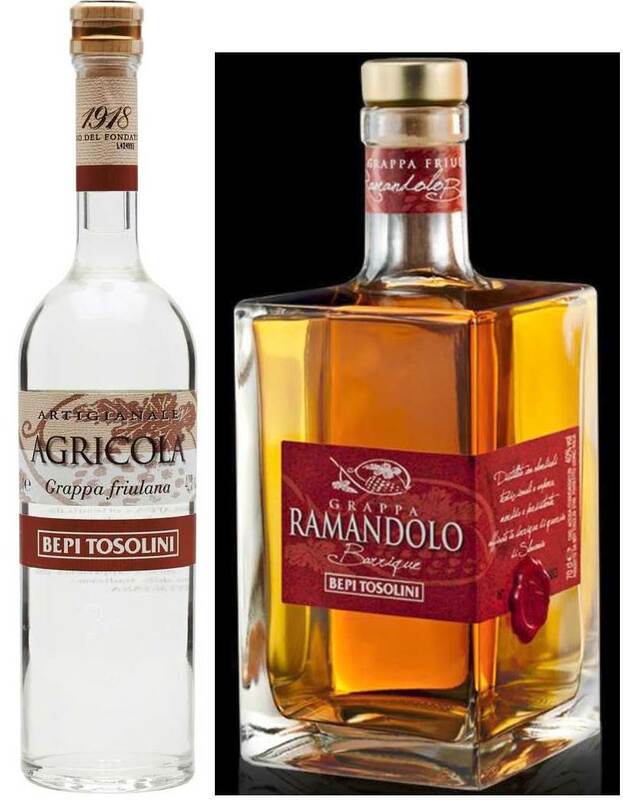 And aging can extend well beyond 18 months: several distillers – Bonollo and Castagner, for example – were experimenting with multiple-year spans, up to 14 years. 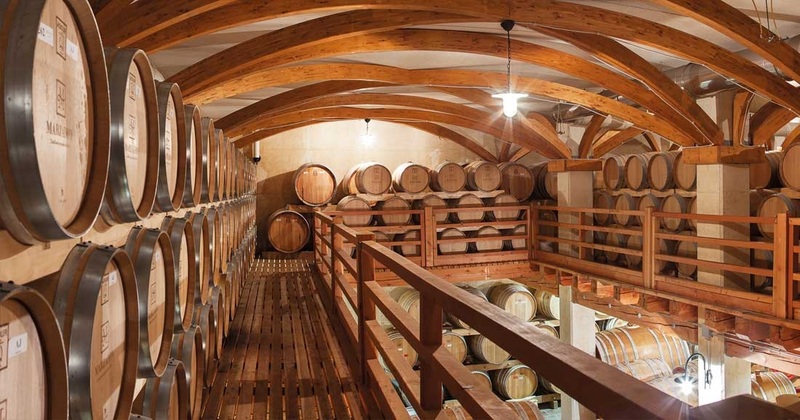 The condition of the wood used for aging makes an even greater impact on the finished grappa than does the kind of wood. New oak, or any fresh, unused wood barrel, will impart more sweetness – that vanilla taste – than will a used one, and a lightly charred (toasted) barrel can give coffee and even chocolate notes to a grappa, just as it can to a wine. Barrels in which wines were previously matured also contribute a whole other range of flavors to grappas. It seems fairly common for grappa makers to age Amarone-derived spirits in old Amarone barrels, for instance: This is in fact something of a long-standing tradition in the Veneto. And we also encountered grappas distilled from Brunello pomace being aged in used Brunello barrels. But individual producers all had their own preferences, according to the style they were seeking for their grappas. Castagner, for instance, the largest distiller we visited, rests all the grappas it intends for aging for six months in cherry wood first, to soften them some, before passing them into barriques to finish their maturation. This was intriguing to me, though I am far too old and cranky ever to surrender my preference for traditional, clear grappa, whether it be made in the fiery style or what Italians call morbida – soft, and often lightly fruity. For my palate, the most successful aged grappas were those that, along with the acquired quasi-Cognac quality that wood aging imparts, retained a recognizable grappa heart – the firmer spine and tiny hint of fire that bespeaks grappa. We tasted many grappas, of varying ages, that were very nice brandies, but weren’t grappas any more. A few of these, like the 14-year-old we tasted from Castagner, although no longer recognizable as grappa, had become very fine brandies in their own right: They’d metamorphosed into some third thing that wasn’t grappa or cognac, but nevertheless an excellent drink. I’ve already written long enough, and presented complications enough, for one post. Next time, I’ll follow up with an account of the distilleries we visited and the grappas – and their variants – we tasted. 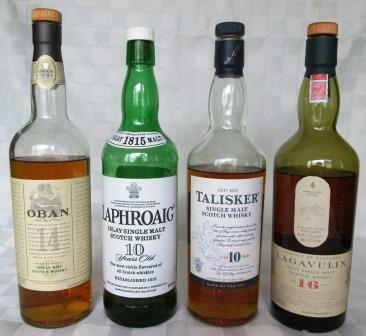 The 10 bottles pictured below are the sad remnants of a once formidable collection of grappas. Once upon a time, I had 40 different kinds. How the mighty have fallen! And just look at the low fill levels in these survivor bottles: I have a terrific ullage problem, as you can clearly see. I trust you can also clearly see why it’s imperative for me to spend the next 10 days in Italy visiting grappa distilleries and – speriamo – replenishing my sadly diminished supply. I’ll tell you all about it when I get back. If you’re a praying person, it would be thoughtful of you to drop in a mention of my liver. I attended an event about two weeks ago of great interest to me: An Italy-wide association of distillers is – finally! – taking organized steps to present grappa to America. As a long-time grappa appassionato, I have been hoping for some sort of action like this for decades. I sincerely believe that, when properly introduced to it, many Americans will enjoy grappa. I know that the great majority of those for whom I’ve poured it found themselves very pleasantly surprised that grappa is far from the “jet fuel” they had always been told it was. That it never really was anything like that is beside the point now, when grappa distillation has soared in terms of quality and sophistication all through Italy. More popular than ever in its homeland, grappa has escalated and diversified enormously since the days of its first “discovery” by the sophisticated skiers of Italy’s Dolomite and Alpine slopes. Now, monovarietal grappas, rather than those made of blended pomace (vinaccia, in Italian), have become the norm, and the charm of the gentle ghost of each of Italy’s many fine wine grape varieties contributes to the allure of one of the world’s great after-dinner drinks. Words and photos can never fully convey the pleasures of grappa. 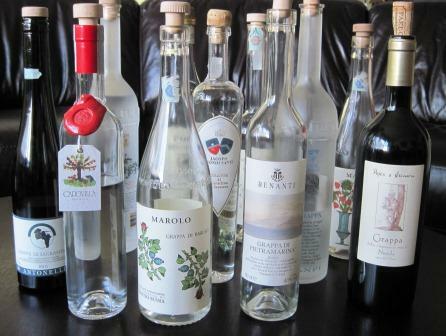 Taste some and enjoy them yourself: It’s really the only way to learn anything about wine or grappa. All were fine, and I especially relished their monovarietal, unaged grappas – true spirits of the vine. It’s no news to any of my regular readers that I love grappa. I have always loved it. Even before it was fashionable, even before what was available here in the US was really good, even when all one could get was thought of as Truckers’ Breakfast, even when some of it gave white lightning a good name, I loved grappa. And now that the Italian national distillate has become a fashionable object of pride and connoisseurship, when it has become available from every region and every wine zone and practically every grape variety, I love it all the more. I feel as if my fidelity and devotion are being rewarded, and the grappa gods are smiling on me. So you can imagine the sense of beatitude I felt when I found out recently that Marolo grappas are going to become more readily available here. Marolo is one of my favorite distillers: I’ve not tasted all of its products, because it produces a great number of different grappas, but I haven’t yet had one I didn’t like – a lot. So this news was elating for me: I had to find out which grappas would be coming to the US, where they would be available, how soon I could get some. Gimme gimme, gimme. Those of you who don’t know grappa have of course no idea what all this fuss is about. After all, in essence grappa is just another distillate, and in some respects one of the simplest of them, especially since a lot of us grappa tifosi think the clear, unaged ones are the best. Grappas are distilled not from wine or from fruit but from pomace, the solids left after the fermentation of the grapes, what is called in Italian vinaccia. The best of them are made from the vinaccia of a single grape variety, and they are distilled while the vinaccia is still very fresh. Barolo-maker Bruno Ceretto, who knows his grappa, told me many years ago that grappa should be made the way the moonshiners do: quick, quick, quick. Done that way, the varietal aromas and even some of the varietal flavor make it through the distillation process and into the crystalline liquid that flows slowly out of the still after hours of boiling and refining and condensation. That’s why, during the harvest season, devoted still masters don’t sleep, or if they do, it’s alongside their carefully tended copper vessels. Their wives may complain (and they do: I’ve heard them), but grappa, like science, is a demanding mistress. My mention of a Barolo maker wasn’t incidental or accidental. 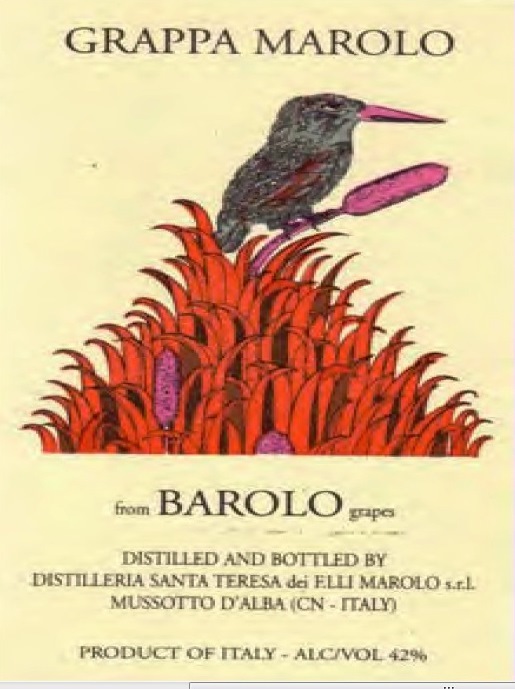 The Marolo distillery is located just outside of Alba, in the heart of Barolo/Barbaresco country, and one of the firm’s ambitions is to become the Nebbiolo distiller. 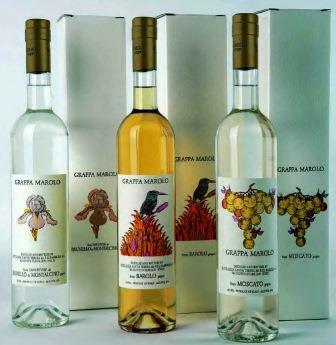 So the initial consignment of Marolo grappas to this country focuses mostly on Nebbiolo and Barolo grappas. The list includes a clear, young Barolo grappa as well as Barolo grappas aged 9, 12, 15, and 20 years. The latter, as you might expect, looks inky dark from the color leached into it in its years of aging in barriques that had previously been used to age Marsala. Marolo is also sending other Piedmont specialties: a clear Moscato grappa and a slightly aged one (five years in barrels that previously aged passiti from Pantelleria) called Dopo Moscato. The importer, Premium Brands (distributed by Martin Scott), is bringing in as well Marolo’s Brunello grappa, which I believe is, or used to be, distilled from the vinaccia of Angelo Gaja’s Montalcino vineyard, Santa Restituta, plus an intriguing Gewurztraminer grappa from vinaccia from the Alto Adige, plus the Marolo firm’s only blended, non-monovarietal grappa, a very pleasing Amarone grappa, lightly aged in small used Amarone barrels, as is the Veneto tradition. Lovely as these are, they represent only a fraction of Marolo’s line. Really, the firm is a Piedmont-varieties specialist, not just a Nebbiolo master, and it makes sterling grappas from all the important Piedmont grapes. I particularly love its clear, fragrant Barbera grappa, and I hope to see it on the market here soon. I know summer is not supposed to be the time for thinking about, much less consuming, brandies, but I can’t help it: I’m addicted. For me, nothing completes an enjoyable dinner as well as a fine digestivo – or digestif, if you prefer. Whichever you call it, those names indicate exactly what that little tot does: Settle in the good food you’ve just ingested and comfortably begin the process of digesting it. Not that I need to have eaten to the point of discomfort: far from it. I’m talking about a good, modest dinner, not a Coney Island hot dog eating contest. Perhaps in my distant youth I might have been interested in some such marathon, but these days I couldn’t even if I wanted to: Age and metabolic changes (they will come to all of us) have drastically reduced my consumption. Diane and I together now can’t finish a T-bone steak that once would have been just right for one of us. Our capacity is way down, but that doesn’t make a juicy piece of beef any less delicious: Now more than ever, it’s quality that counts, not quantity – just as, with wine, it has always been quality that mattered more than alcohol. So the only question in my mind is not whether one should end a good meal with a little snocker of something, but with which one? Armagnac? Calvados? Cognac? A fruit eau de vie? Grappa? Marc? Tequila? Single-malt whisky? And which one of the many in each category? There’s no easy answer to that: Each has its niche. And it isn’t just a question of the great diversity of these drinks. No: It’s also the fact that each one of these spirits alters with the food you’ve consumed before it. That can be most obvious in the case of grappa, where the same specimen will sometimes smell freshly fruity and sometimes reek like aged Parmigiano, but it is equally true of spirits seemingly more well-defined, like Cognac or Armagnac, which, when they are not exactly what the doctor ordered, can be either too fiery or too sweet, depending on what foods they’re following. I know only one way to determine which little tot to choose on any given evening: Pull the cork and sniff the bottle. Usually, the meal’s flavors in your mouth and scents in your nose will point to a broad category of spirits: an Alsace fruit eau de vie, or a Piedmontese or a Tuscan grappa, for instance. 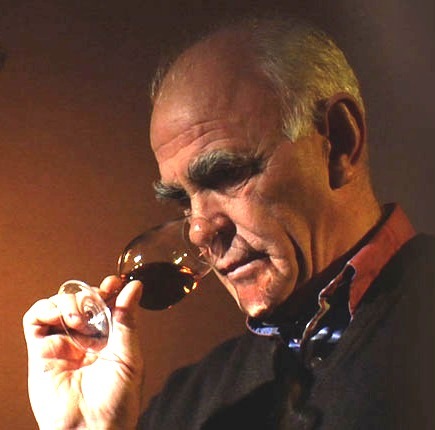 But after that, only taking a good sniff from a bottle or two or three will make clear to you whether you want Framboise or Poire, Barbera or Moscato, Sangiovese or Canaiolo – or maybe you want to go in a completely other direction and pour yourself a wee dram of peaty, smoky, seaweedy Oban or Talisker. I’ve enjoyed all of the above at different times and in different circumstances, and each has had its moment when it seemed like the only taste in the world that could fit that moment. Equally, I’ve had times when I sniffed the bottle and thought “Why in the world would I ever drink that?” The process is always illuminating, and the result is always fun, haphazard as it may be. What actually causes these changes, in the drink and/or in my perception of it, I don’t really know. Science has other things on its mind, and no wine journalist I know of has made a serious study of this phenomenon – but it strikes me as far more interesting and pertinent to day-to-day gastronomic contentment than the molecular composition of any of Ferran Adria’s foams. That’s not the chemistry I’m interested in. Much of my contentment and my health, both mental and physical, derive from the day-to-day experimental science of the table and its pleasures. Recently, I’ve been spending more time than I really want to with members of the medical profession – nothing life-threatening, but a few symptoms that are quality-of-life disturbing – and some MDs seem both unfamiliar with the concept of pleasure and incapable of pronouncing words like “wine” or “cognac” or even “beer.” To the puritanical breed of White Coats, there is only Alcohol; and it’s all the same, and it’s a poison. No matter how healthy your liver and kidneys, brains and guts may be, it’s poison, and if you “use” it, you’re killing yourself. I’ve given up asking such doctors whether metabolisms aren’t sufficiently different to make generalizations like that useless, and pointing out that I don’t plan to live forever and would willingly trade off a few years of gustatory boredom for a slightly shorter span of intense palatal pleasure. That’s my version of the choice of Achilles. Sadly, such MDs don’t seem to even comprehend the alternatives. Not all are like that, of course: Occasionally I come across a sybarite who, while poking my torso in search of overripe spots, happily picks my brain for wine suggestions. Maybe I should bill them for the consultation? All this is not as far off my subject as it might at first appear. It’s no accident that brandies and whiskies and that whole class of distilled drinks used to be known as cordials. They were thought to be – and I think they are – good for your heart. And remember, many are still called eaux de vie, and eau de vie means water of life. Now that I think of it, that too is what whisky means. I don’t think any of this etymological convergence is accidental. Stoking digestion is good for you, and doing so with a complex and delicious, gently fiery small glass of spirits (again, the word is no accident) is one of the more brilliant inventions of our flawed civilization. In winter, a young (or especially a not-so-young) man’s thoughts lightly turn to grappa. Once feared as the diesel fuel of brandies, grappas have now become one of the most fashionable of drinks, shedding their working-class image as the Alpine trucker’s favorite breakfast – and a lot of their character – to become sleek and polished. Most Italian restaurants of any claim to sophistication now boast an array of grappas, though not of the depth and variety of the grappa cart that you will find at, for instance, Cecchino dal 1887 in Rome’s Monte Testaccio district. My own collection once numbered 23 bottles. It has now dwindled to 11, and many of those are perilously low. I’m going to have to do some serious buying soon. Don’t get me wrong: those numbers are not just for swank, nor am I exclusively grappa-obsessed. I love Armagnac and Cognac and calvados and aged tequila, and they all have their place – but none of those offers the variety and versatility of grappa. There is no better digestivo, and in one of its old-fashioned roles – to tone up a cup of espresso on a raw winter day, such as we’re having an abundance of this winter – nothing comes close to the warmth generated by grappa. But the main reason I like to keep so many grappas around is simply grappa’s wondrous variety. Cognac or Armagnac is essentially one thing, while grappa is legion. 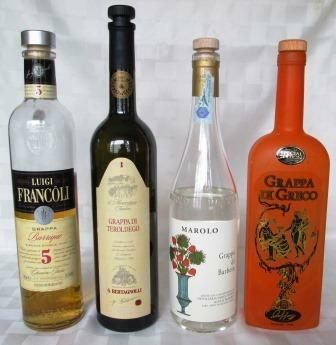 Grappas are as varied as their sources, and their sources are from all over Italy. Furthermore, they differ from each other not just because of where in Italy they originate, but also because of what grapes contribute their essences to their begetting. 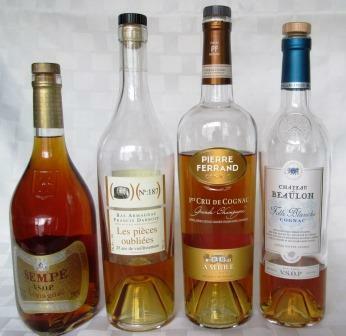 Cognac and Armagnac, each named for the almost neighboring regions of their origin, are brandies distilled from wines. In both cases, the most common grape used is Ugni blanc, better known to Italian winelovers as Trebbiano, which rarely yields a wine of distinction but can make some excellent brandy. There are some variations, to be sure – it matters if a Cognac comes from the Fine Champagne or Bons Bois or Borderies areas; and a few really superior Armagnacs are distilled from Colombard or Folle blanche wines. Grappa on the other hand comes from pomace, the solids left at the bottom of the fermenting tank when the wine is drawn off for aging or blending. These are soaked and refermented, and that liquid is then distilled. Each distillate holds the scent and often a tiny ghost of the flavor of the grape variety from which it is made. 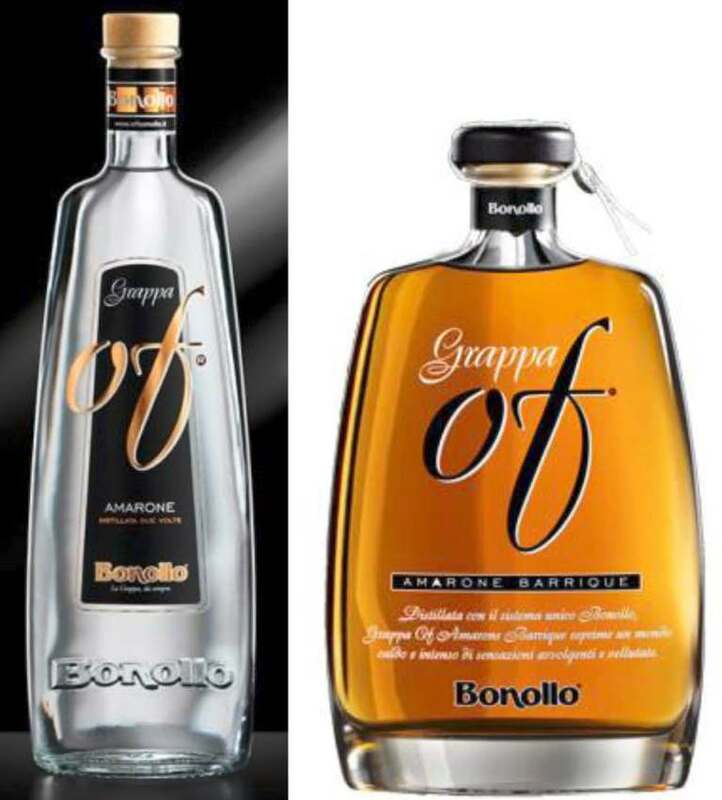 So grappas are as numerous as the grape varieties their makers chose to ferment, modified by the soils in which the grapes grew, modified by the choices the grappaiolo made about the number and kind of filtrations, whether to age or not, and if so in what. 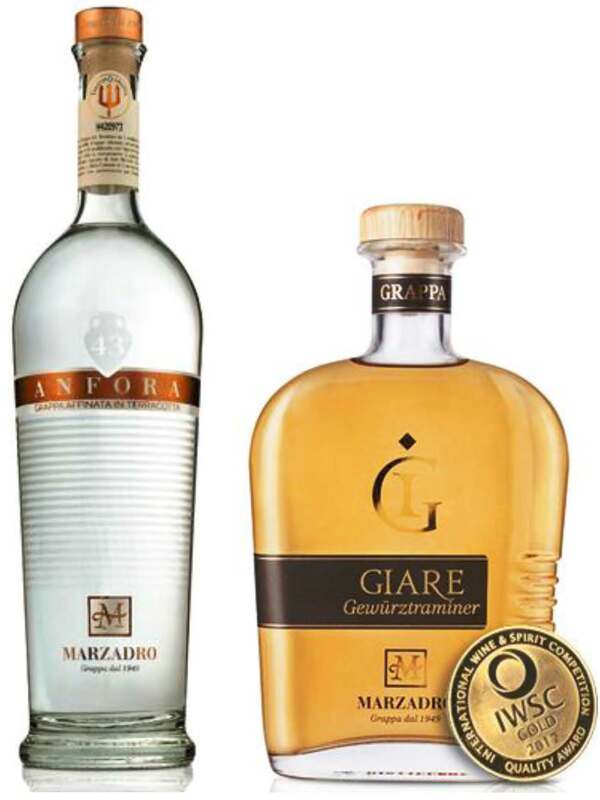 In the broadest stylistic difference, the grappa maker has to opt for either a forte or a morbida grappa – a grappa stronger and more obviously alcoholic, lightly fiery in a style that tips its cap to grappa traditions, or softer, more obviously fruit-inflected, in the modern style that has become internationally popular. That adds up to a bounty of grappas, an abundance of differently nuanced brandies that readily explains why I never seem to have quite enough of them on hand. Moreover, grappas vary not only in their origins and basic character, but also with what you’ve eaten. I can’t explain this, but empirically I know it to be true. 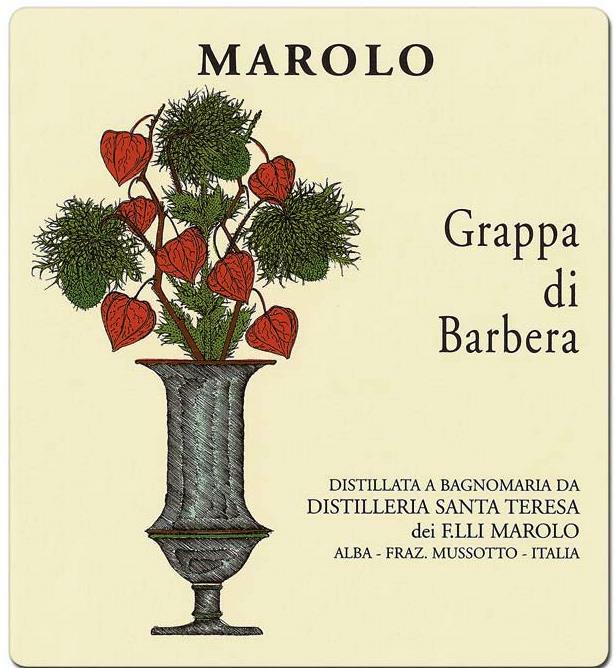 A classic, clear grappa di Barbera, for instance, such as one gets from the Fratelli Marolo distillery, just by itself gives a clear, sharp aroma of its grapes and a similar, though fainter, palatal impression of the Barbera from which it started. With different foods, however, it can smell – and taste – either of the grape, as just described, or floral, or even like aged parmigiano cheese. (Oddly enough, the more chilled a grappa is, the more forceful its aroma. I don’t pretend to understand that either, but empirically I know it to be true.) That’s why, after dinner, I like to sniff a few grappas and choose the one that’s working well with the meal I’ve just eaten. It’s fun, always instructive, and totally uncomplicated. A simple smell test – just open the bottle and pass it under your nose, inhaling – will tell you whether the grappa in your hand is the one you want in your glass. Brandy professionals buy and sell, blend and isolate, not by tasting (they wouldn’t last long if they did), but by scent alone. It can work the same way with grappa, and it doesn’t take hound-like olfactory abilities to do it: Ordinary human equipment works just fine. I retain my fondness for the more old-fashioned grappas, unaged and crystal-clear, smelling of their vinaccia, and tasting ever so slightly fiery – though there are many modern-style grappas that I also greatly respect. But you never really get over your first love. Nowadays, that kind of grappa is not always easy to find. Many are being wood-aged, which moves them closer to Cognacs and Armagnacs in style, and to that extent denatures them. Many are blends of different grapes, which makes them stand in the same relation to a monovarietal grappa as blended Scotch stands to single-malt whisky. 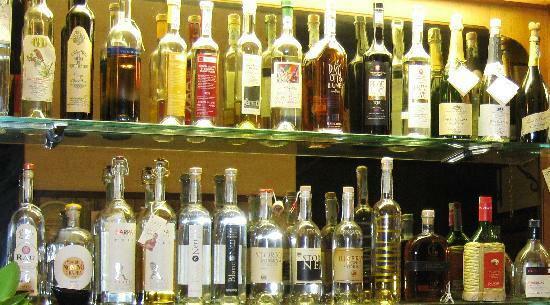 And many are now distilled from wines or even whole fruit – these are often labeled eau de vie or ue. But the use of either of those terms isn’t consistent: Some (what I consider real) grappas are labeled eau de vie as well. Despite the fact that grappa-making has now spread through all of Italy, the traditional heartlands of grappa are still the most likely sources for really top-notch distillates: the north – Alto Adige and especially Piedmont, the Veneto, and Friuli – and Tuscany. The Veneto produces some of the most characterful aged grappas, the color of Cognac but still retaining intense grappa scents and character. Piedmont, Friuli, and Tuscany make lovely unaged grappas. 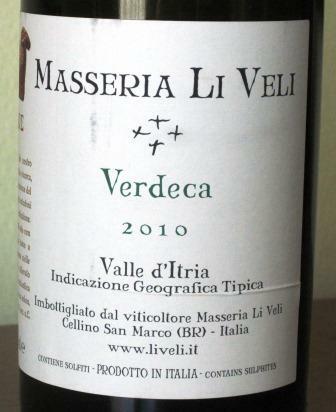 Look for single-varietal bottles such as those from Pojer e Sandri (Alto Adige) or Fratelli Marolo (Piedmont) or the Morellino grappa of Jacopo Biondi Santi. Or for estate grappas, such as those from Castellare, Fontodi, or Monte Vertine in the Chianti Classico zone or Banfi in the Brunello di Montalcino zone. Sip and savor them just as you would a fine Cognac, and add a whole new digestive dimension to your life.